Ok, so the AFL (Australian Football League) final was like, a week ago, and I'm totally living in the past here, but I did this mani and never got to post it because of the 31 Day Challenge. Seeing as I'm a little wiped out and need a polish break, I'm going to take this opportunity to show these nails anyway, plus I actually managed to score a $50 prize from Coral Colours Cosmetics here in Australia for winning their Footy nails comp, so I think I need to put them here for posterity. I created these nails using two of the Ulta3 Footy Nails sets from last year. I was sent a couple of sets to review and wouldn't you know it, those two teams were in the Grand Final this year. 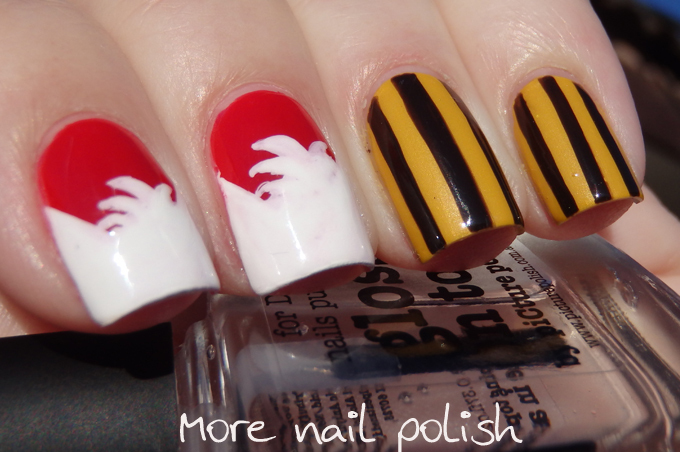 The Sydney Swans nails were done using Lily White and Scarlet. Scarlet is a gorgeous pigmented red jelly, but note to self for next time - remember to double base coat if wearing the made in Taiwan version of of Scarlet, she's a stainer! 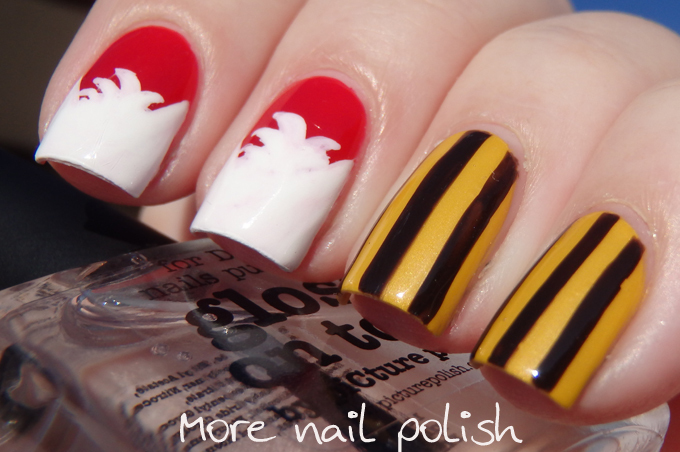 The Hawthorn nails used General Mustard and Fudge Brownie. Both these shades were only released in this set and not separately. Which is a shame because General Mustard is particularly nice and one of the few Ulta3 yellows that's a true two coater. 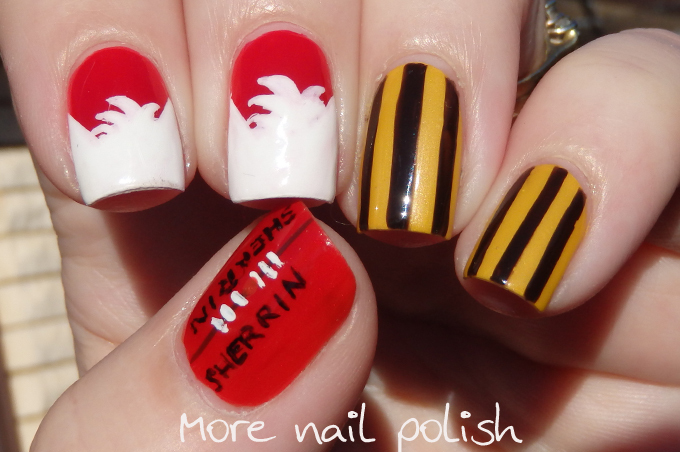 For the Sherrin foot ball, I used a coat of Ulta3 Burnt Orange and then a layer of Scarlet. This gave the nail a slightly more orange tone to it. I'm just annoyed at myself that I didn't get the writing spaced better on the close side of the nail - just not concentrating enough when I did them. I figured i would swatch both of the Ulta3 shades, because I didn't have them in my Ulta3 nail guide. Fudge Brownie is a very dark chocolate brown. This is two coats with Seche Vite top coat. The white marks on my nails are the clouds reflecting on them in the sky. General Mustard is an egg yolk yellow with a slight silvery shimmer. This is two coats with Seche Vite top coat. love this nail polish and you nail art ! we could follow each other if you agree ! have a nice weekend , dear ! I love the footy nail on the thumb! !